When Arrow Building Center made the decision to begin manufacturing their own wall panels due to increasing demand, Division President, Ron Schumacher knew he needed a General Contractor he could count on because he knew he wouldn’t have time to manage the project on his own given the fast timeframe for completion. And the project was an aggressive one. Arrow Building Center partnered with Derrick Building Solutions as the Design-Build General Contractor and focused their efforts on an 8-acre parcel for sale which was adjacent to their Hudson, Wisconsin, facility. The property had an existing warehouse and greenhouses on it and needed a significant amount of demolition and prep work in order to make it useable. It also needed to be re-zoned as part of the process. During a six-month period prior to closing on the property plans were developed to clear the site, renovate the existing 7,000 sq. ft. warehouse into Class A office space, administrative support, break area, and drivers lounge, and build a new 24,000 sq. ft. manufacturing plant on the site. The project began in July of 2017 and was completed in January 2018. 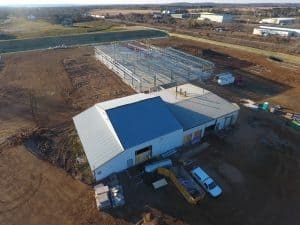 An amazing seven-month project raced along from removing the greenhouse structures and preparing the site, then proceeding to renovate one structure while building a new 24,000 sq. ft. state of the art manufacturing plant to produce pre-fabricated wall panels. “There was a lot of pressure during the project,” Schumacher added, “we had orders to fulfill and needed to get the new plant up, operating, and filling orders by March.” Previously, ABC had outsourced construction of the wall panels, but they needed more capacity and made the move to begin producing them on their own. Beyond the expansion of facilities, this move expanded their business into manufacturing operations which was another major accomplishment to take place during a very short timeframe. “Construction is our industry, so I might have been a tougher customer than most. We know as well as anyone that unexpected situations inevitably arise during a project and even though emotions might have run high at times, Mark was patient and professional in managing all aspects and keeping our project on track,” Schumacher added. The 24,000 sq. ft. manufacturing facility is a Butler pre-engineered steel framed facility. “In terms of special features in our facility the focus was on power and water. We needed power for our new manufacturing equipment and given our location in the township our sprinkler system required the support of three major pressurized water tanks to be built into our facility,” Schumacher said. Wall panels built by ABC are used primarily in apartment, hotel, and senior living construction. They are also becoming more popular in single family housing. The wall panels provide faster framing, accurate factory-built components, and endless design possibilities, and are expected to continue to grow in popularity. The panels built at the Hudson facility are available throughout Eastern Minnesota and Northwest Wisconsin through existing Arrow Building Center lumberyard locations. See more photos from this project when you click here.